I was member of Melbourne Wireless for some time while I lived in Abbotsford (node CIA). During this time I tested the beam pattern of a Harris Coffee Tin used as a circular waveguide. The polar plot below summarises the results. 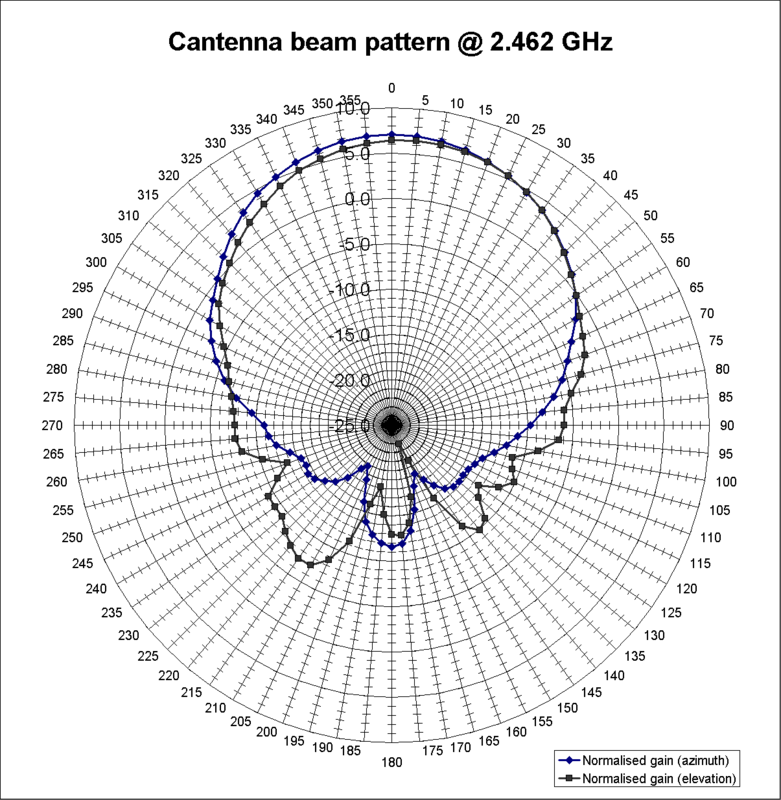 Essentially, the device under test, a harris coffee can of internal diameter 98mm, with a tuned 1/4 (28mm of copper instead of 31mm) wave stub was placed on a post and rotated in an anechoic chamber. From about 8m away, a series of measurements of received signal power were taken by a spectrum analyser. A signal generator was used to launch a constant 10dBm at 2.462 GHz (choice of frequency is a long story, I’ve now forgotten) through a source at the device under test. The directivity or gain of this cantenna is found to be between 6 and 7dBi. I did intend at that time to make modifications and perform further testing to determine the improvement gained by adding an extra length of can to make it 5/4 guide wavelengths long; a choke; a spreader. It’s been some years since I’ve had access to the equipment and the chamber though, in fact I think with the movement of Telstra’s research laboratory team into the CBD, it is likely the facility no longer exists. Gain approximately 6.5dB in a quite symmetric lobe. Equipment: Signal generator: 10dBm output power. <src?>. Measurements with Spectrum analyser. Seems that you would expect to receive -44dBm from an isotropic radiator with this setup.